Merry Christmas: DDA, Vegas Show Boy, & Daddy Chant! If this doesn’t jingle your bells, I don’t know what will! We then went to Scott’s parents for food, fun and more exciting gifts! 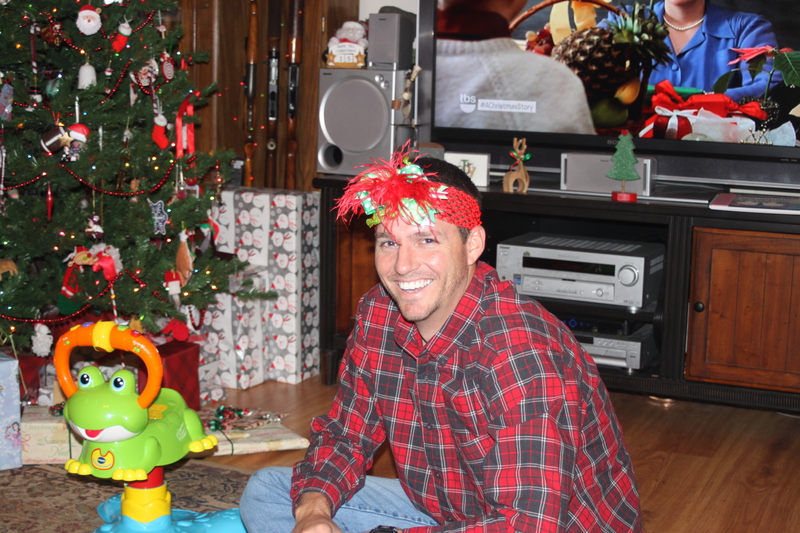 My personal favorite part was when Scott put on Landri’s Vegas showgirl Christmas headband (to show her how to wear it) and of course you know who was there waiting with the camera in hand to capture this awesome moment for posterity! Landri is also obsessed with wearing my gloves. It’s kind of funny because she can’t do anything with her hands when she’s wearing them because they are so big, but she waves her hands around and squeals with glee (including a pic of this below as well). Anyhow, it was a great day! And then today we took her to the park and wouldn’t you know it, but Landri stepped in dog poop. Of course I didn’t realize this until I had picked her up, gotten it all over my dry-clean only vest (and hands too). So awesome. If it’s not her poop, it’s someone else’s! Anyhow, it was still fun and it wore her out (pics below as well)! She is also still a huge fan of the slide! And lastly, just on a random note, I’ve mentioned before that Landri says, “Daddy” all day long and is always looking for Scott everywhere we go. Even at school she’s always talking about him. Anyhow, the last day or so, she has started what I call the “Daddy Chant.” She literally chants, “Da-ddy! Da-ddy! Da-ddy!” over and over with a strong rhythmic cadence. It is adorable but makes me crazy! It’s one thing to always be asking for him, but now we’re CHANTING it??? Why can’t she just say “Mommy” once?! We only spend every waking SECOND of every single day together, LOL! Hope yall had a great holiday! Hugs!